Support Real Love Campaign and win a Team Manila shirt! Cancer is one of the most deadly diseases there is and can affect people of every age. It is hard to perceive no matter what your age, but for children, can be especially traumatic. Estimated of 3,300 new cases of childhood cancer are diagnosed in the Philippines each year. Back in 1st year college, we attended an outreach program for cancer patients held in Philippine Children’s Medical Center. We had activities like games, story-telling for the cancer patients. During the program, I was really amazed how those children see life. Although fighting cancer at a very young age, they were neither sad nor angry. They still have positive attitude towards life. It shows that a strong support system can go a long way toward helping a child cope and maintain the positive attitude that will help the cure be effective. Kythe Foundation is one of the non-stock, non-profit organizations in the Philippines that provides psychosocial care to sick children in hospitals. It‘s advocacy is to improve Quality of Life for pediatric patients by uplifting their spirits and strengthening HOPE in these patients and their families. With the willingness to share with this mission, Unilever Foodsolutions partnered with Kythe to roll out the new 5.5L mayo tubs of Best Foods and Lady’s Choice to its operators in a more meaningful manner. 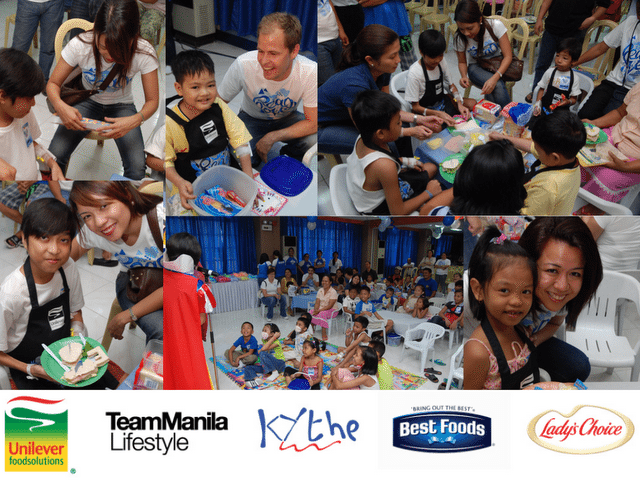 Dubbed as the Real Love Campaign, Unilever Foodsolutions and its operators go to outreach programs that have fun healthy sandwich making activities, arts and crafts and storytelling sessions to the kids with cancer in Kythe’s partner hospitals. Unilever Foodsolutions further shares the opportunity to share Real Love to the public with its official Facebook page. With every 1,000 “Like” entries until it reaches 10,000 fans, Unilever Foodsolutions will donate 1,000 sandwiches to the different Kythe partner hospitals. Also, in line with this campaign, Unilever Foodsolutions partnered with Team Manila to come up with a specially designed, limited-edition shirt which will be available in Team Manila outlets in Rockwell, SM Mall of Asia, Trinoma and online through its website. With the retail price of 550 pesos, Unilever FoodSolutions and TeamManila collaboration shirt are available for both men and women in various fits. Parts of the proceeds will benefit Kythe Foundation for kids with cancer. In partnership, children with cancer in Kythe’s partner hospitals get to experience creating healthy sandwiches, storytelling sessions and making arts & crafts. 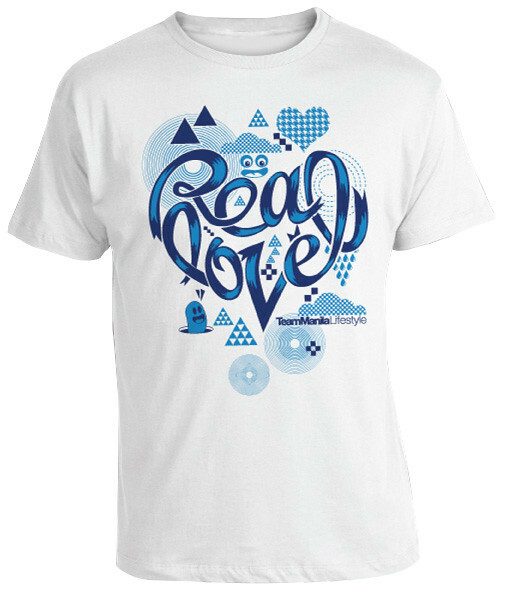 Want to get a limited edition Real Love shirt? 2. Complete this sentence: “I will share my love to the kids of Kythe by____________” and post your answer in the comment box below. On October 8, the best answer will win one (1) Real Love shirt! Winners need to be within the Philippines only. Ms Janette Toral is still looking for bloggers that can run their own small contest to encourage further support for Kythe. If you are interested, just check her post on Showing Real Love for Children with Cancer. Let’s support Real Love campaign and do our share to make a great difference in a child’s life. As they say, KIDS should be flying KITES, NOT fighting CANCER. I will share my love to the kids of Kythe by spending time with them. Cancer patients need people who will be with them, giving them love and care. To be able to make it you must allot a time. Share your happy moments, tell them stories that can inspire them, play with them or anything to make them happy. Spending moment with cancer patients is the best donation I can give. I will share my love to the kids of Kythe by spreading the word about Real Love Campaign to gain more support from other people. I may not have the luxury or wealth to donate money but surely I can spare some time in prayer and in fasting in the hope that the children of Kythe would get better and have a shining future. I wish the kids a happy day, everyday. I will share my love to the kids of Kythe by spreading the word about the Real Love Campaign and praying for more volunteers and donors so that they can continue to bring joy and hope to the lives of these kids who are struggling everyday with their illness. I will share my love to the kids of Kythe by teaching them and encouraging to listen. We all know that everyone of us can teach when we start in ourselves. So i will teach then the right manners in life. By volunteering and through ways of it LOVE would never be without patience. I will campaign about the Real Love Campaign and start for spreading the big news how worthy it is when you join the Real Love Campaign. We can all help thousands of children who are suffering from harshness in this world. I am from a poor family, i can only give a help by prayers that God will always protect and guide us. I will share my love to the kids of Kythe by staying beside them and have some quality time. We will just laugh, fly if possible and forget the world for a while. We will paint the sky blue and put rainbows on it. We will fly kites and soar high! Hi! We met at Bloggers Fiesta. I will share my love to the Kids of Kythe by spending an hour or two of storytelling sessions. I will share my love to the kids of Kythe by sharing and spreading the Real Love Campaign to my family and friends. I will pray for their healing and more kind hearted donors and volunteers to help them fight for their life and happiness, children’s deserve to be happy and smile everyday. They are our hope for our world better future. WE should support and help them even in our little ways. I will share my love to the kids of Kythe by signing up as a volunteer to the program, I heard that monthly they are conducting reading sessions with the kids and I would like to participate on that. I am an oncology (cancer patients) nurse working in one of the hospitals here in Makati and I can see the pain in their eyes specifically in doing treatments like chemotherapy, what more if the patient is a child or a kid that nothing can do but cry.Volunteering in their institute is my best way of giving them LOVE. I will share my love to the kids of Kythe by giving inspiration and aspiration to our future hopes (the kids), by supporting your ads and campaigns in spreading the happiness and love. . .<3 <3 <3 and by giving something that's beyond any material thing can buy. . . I will share my love to the kids of Kythe by entertaining them the best way I can do. I can dance pretty well and sing a bit. I can read them some children’s stories because I know children likes them since I love reading them too when I was still a kid like them. I can also take pictures of them and teach them scrapbooking. This is the best way to preserve memories, to reminisced them during those times when you need them the most. With these, even though I’m still young, I know that I can be of great help to them. Being able to share my gifts and talents, and my time with them, I can make them smile and be their friend and one of their important memories in their lifetime. I will share my love to the kids of Kythe by featuring their stories of struggle and happiness in my blog to create awareness and encourage my readers to extend their help to KYTHE Foundation. I will share my love to the kids of Kythe by sharing my blessings and reaching out to them. I may not be there but my heart and prayers is always with them. I will help and share the Real Love compaign to all. My mom has been battling cancer too and I understand the feeling, it is hard.